Yesterday was Baby Kulture’s first Christmas and Mama Cardi B made it one to remember. After documenting lavish gifts and trays of delicious food throughout the day on her Instagram Story, Cardi enjoyed some well-deserved relaxation with her little one. 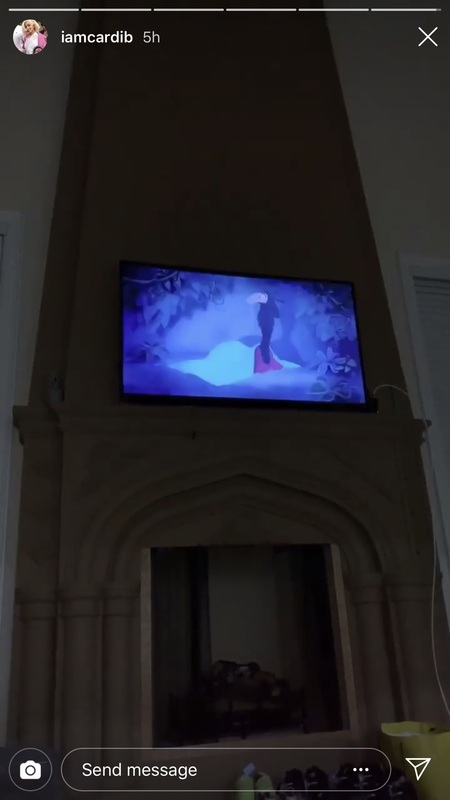 In her final update of the day, she posted a video of Kulture resting on her chest as she watched a movie on the couch. But it wasn’t just any movie. It was one of the best and most underrated Disney movies of all time: The Emperor’s New Groove. “I love this movie,” Cardi whispered, likely in attempt to not wake a sleeping Kulture. And Cardi? SAME. If you’ve never seen it, The Emperor’s New Groove, which came out in 2000, is a cartoon about Kuzco, a selfish Incan emperor. After he fires his sinister adviser Yzma, she attempts to poison and kill him. But she accidentally (and hilariously) transforms him into a llama instead. Chaos ensues and a good time is had by all. The Emperor’s New Groove is required viewing for all Disney lovers. Honestly, it’s the perfect movie to watch on Christmas. Hey, Cardi: Thoughts on playing Yzma in a live-action remake of The Emperor’s New Groove? Because Twitter certainly seems to think you’d be perfect for the role. Okay but you can’t tell me that cardi B doesn’t sound like Yzma from Emperor’s New Groove? Regardless of your opinion on Cardi B's rapping, one must admit her cackling Yzma-from-Emperor's-New-Groove-like laughter is pleasantly endearing. We’re not getting our hopes up, but seeing Cardi B in a live-action remake of The Emperor’s New Groove would be the best news ever. But even just knowing that she loves the movie is good enough for us.